Since 1944 there’s always been a Cronmiller At the Bridge. It started with my Grandpa George the Bait Man and his wife Grandma Annie. During their time grandpa would take parties out for a days fishing from the dock here at the bridge on one of his two wooden boats named The Ruth and The Roamer. The bait shop was in full swing and grandpa would take us kids out minnow catching to Pottahawk and the Bluffs towing a big steel scow behind us to keep the minnows alive on the long journey back up the lake. You could find Grandpa travelling the countryside as far away as St. Thomas dragging ponds for crayfish to keep the bait shop well supplied. As we grew older, myself, my brother and sisters all brought trailers to the bridge for weekend get togethers with our families and so began the trailer park. If you weren’t family when you brought your trailer to the park you soon became one of the Cronmiller clan! When Grandma and Grandpa died, my Uncle George stepped in to run the business for many years. It wasn’t unusual to find minnows swimming in the bathtub up at the house. Later my mother and father, Lloyd and Lois Cronmiller, owned the trailer park as well as a restaurant in Long Point called the Harbour Resort( now At Play Adventures, another third generation business started by my Mom and Dad). There’s been some changes over the years. We don’t have the wooden party boats anymore but we do have a comfortable 25' guided pontoon boat to show you the bay and a fishing hole or two. It’s also used for special occasions such as birthdays, anniversaries, or just a fun outing with family and friends where you can view some of the historic landmarks of Long Point from the water or pull up at Pottahawk for a swim and a picnic. We still have two handmade wooden rowboats for rent ( but now they can come with a small electric motor). The original bait shop has been resurrected and now has minnows, worms, and leeches ( but my wife won’t let me keep minnows in the bathtub anymore!). The boat launch is here and we are always around to lend a hand. We still have trailer sites and open dockage available as well as two trailer rentals with boat dockage if you would like. 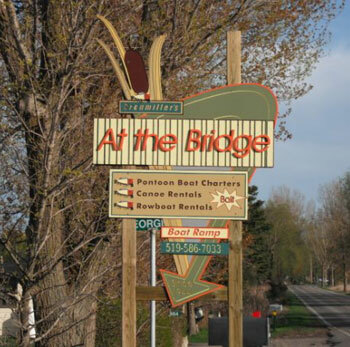 As the third generation of Cronmillers At the Bridge takes over the operation we feel obliged to continue the tradition of greeting you with a smile and friendly service while we help you launch your boat, rent a canoe or rowboat, stay for awhile or go out for a day of fun on the bay.